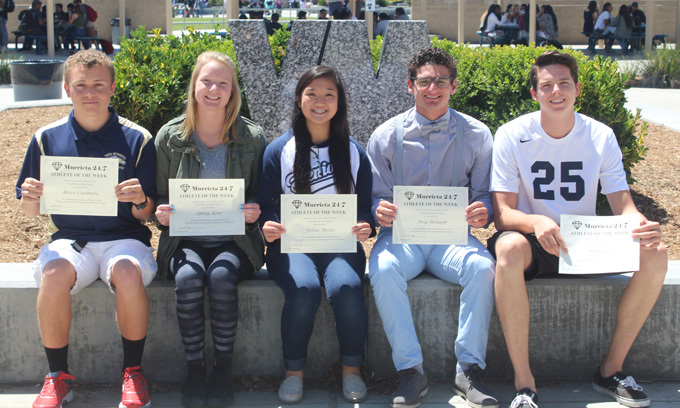 From left: Reece Casimere, Abbey Kerr, Felisa Merto, Joey Hodapp, Noah Potts. Noah Potts had a season-high 6 kills in a match against Perris for the boys volleyball team, which is 19-7. "Noah played hard all week and had some huge blocks at critical points in the match," said his coach, Kristen Cooke. "He has improved tremendously this season." Felisa Merto finished a strong season in girls lacrosse and is receiving the Class award for her efforts. She also has a 4.5 GPA. Junior outfielder Joey Hodapp has played consistently for the baseball team, which is 17-10 this season. Abbey Kerr and Reece Casimere of the swim team were honored for their season-long performances and commitment to the program.